Munich - After a difficult few weeks in terms of results and injuries, Borussia Dortmund coach Jürgen Klopp was able to afford himself a more relaxing moment ahead of his return to the club where he made his name, as BVB travel to 1. FSV Mainz 05 this Saturday (kick-off 15:30 CET). The affable tactician goes back to his roots in a game which he hopes will mark the beginning of Borussia's Bundesliga revival after back-to-back defeats on the domestic front. "Things feel a lot better when you've won a game like that," Klopp said, referring to Tuesday night's 3-1 UEFA Champions League victory over SSC Napoli which leaves last season's beaten finalists with their European destiny in their own hands. "We're far more relaxed, but we have the next challenge ahead of us now." That challenge is a daunting one, both competitively and emotionally. Klopp spent all eleven years of his professional playing career with Mainz before becoming their boss in 2001. The revered coach was the man who led Mainz into the Bundesliga for the first time ever in 2004, before guiding them into the UEFA Cup a year later. Relegation followed, though, and Klopp tearfully delivered on his promise to step down after failing to lead them back into the top flight at the first time of action. "I was given a magnificent send-off," Klopp recalled. "It was always really special game for me. I think it's pretty unlikely we will win the game just by turning up, though." 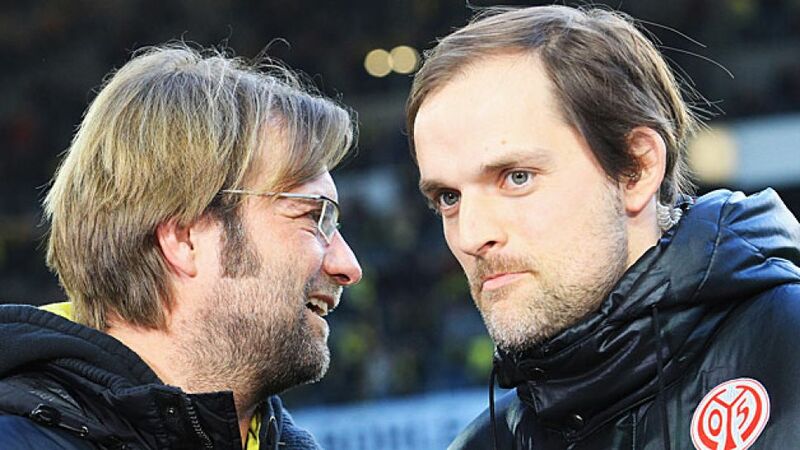 Indeed, Mainz have retained the martial grit instilled in them by Klopp since Thomas Tuchel took charge, and a 3-2 win at SV Werder Bremen last weekend has revived hopes of a return to European football again next season, a feat managed by Tuchel in 2010/11. Just two points now separate Mainz from the top six and that is thanks in no small part to the exploits of Shinji Okazaki. He has netted two braces in the last four games, after having never managed the feat in 71 top-flight appearances. Yet it was not all plain sailing on the Weser, as Bremen threatened a comeback with two late goals, and Tuchel has warned his side to tone things down a little against Dortmund. "We've had a tendency of committing too many fouls in our last few games," he said. "That's an issue. We don't know exactly how we'll eradicate it because plenty of the fouls come from just being over-zealous. We train very actively in tackling so it's a fine line." Getting that balance right is Tuchel's priority, while dealing with a former player of his, Manuel Friedrich, is another. The 34-year-old defender will be at the heart of the Dortmund defence having joined the Westphalians until the end of the season. "Of course it's a blow to Dortmund to have Manuel playing with such little match practice instead of somebody like [Mats] Hummels or [Neven] Subotic, but he can play long balls to [Robert] Lewandowski, who can hold the ball up well. So it actually doesn't help us in the slightest that he hasn't played for the past four months," surmised Tuchel wryly. In any case, exploiting the former Mainz defender's relative lack of match fitness could be the best chance Mainz have of earning a first league win over BVB since April 2010.